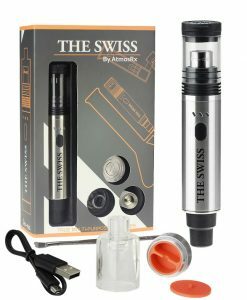 The Swiss vaporizer is the culmination of years of effort and product design with one goal in mind – to create one of the most versatile and high quality multi-purpose vaporizers in the world. The perfect combination of high quality components, compatibility with a wide variety of heating chambers like the Greedy and soldering-free Studio Rig atomizers, and seemingly endless uses, is finally ready to be enjoyed. 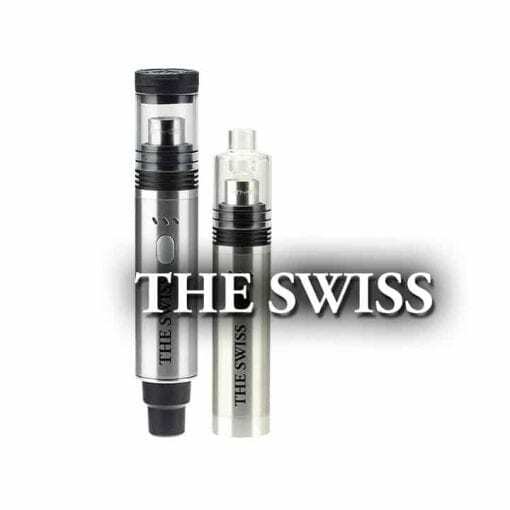 The Swiss is designed to be used primarily as a rig insert, as it is compatible with most standard pipe sizes. This is possible thanks to the unique dedicated airflow tube which provides traditional airflow and reverse airflow during use. This tube can also be removed for cleaning. The Swiss is equipped with a silicon cap and funnel, which allows for quick refills during use. While the Swiss’ design makes it ideal for use as an insert for glass rigs, it can also be used as a portable vaporizer with the Studio Rig Ceramic Chamber (Not Included) as well. As a portable vaporizer, the Swiss sports a splash resistant glass mouthpiece, our patented spring loaded connection, manual operation mode, pre-heat function, and an elegant etched bottom cap that doubles as a container for your dry herbs and wax consistency products. The Swiss is built- to-last with high quality engineering and a scratch-resistant housing to keep it looking pristine after long periods of use. 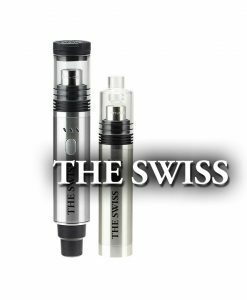 Take control of your vaping experience with the Swiss, and use a true multi-purpose vaporizer that can satisfy all your needs.